Winter may be coming, but that doesn't mean you should stop maintaining your above-ground pool. During the fall, all you need is one night during which temperatures unexpectedly drop and a layer of ice forms on the water's surface. If this occurs, resin or plastic components of the pool can crack if they freeze along with the top layer of water and they will need to be replaced. Plan ahead and protect your investment so that you can enjoy it for future seasons. Buy a winterizing kit, making sure it will work with the number of gallons your pool holds. 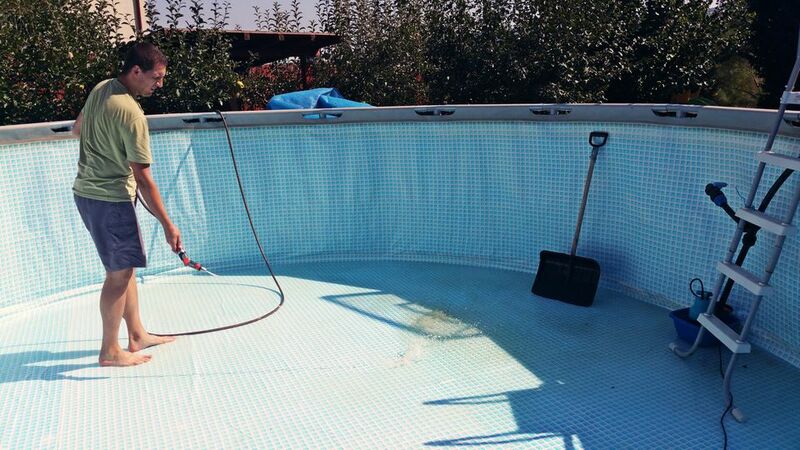 If you've regularly maintained your pool, it will make the winterizing process that much easier. Refresh or familiarize yourself with the parts and components of your pool. During the closing process, take photos of your pool and where its components (like the filter) go, so that it will make the job that much easier when you open in the spring or summer. Just don't delete the photos. Consult your local pool supply store for advice on the correct pool-closing procedure for your region. Winterizing in Southern California is a vastly different procedure than it is in New Hampshire. The order of these steps vary, depending on your climate and the type of above-ground pool and its features. Some of the following steps may not be necessary. Test the pool's pH and alkalinity levels, adjusting as needed. You can't just toss the cover on the pool and hope for the best, come spring. If the water isn't balanced at closing time, you'll uncover a stinky, murky green swamp in five months or so. Adjust the chemicals according to the appropriate ranges on your testing kit. Continue to operate the pool's filtration system until it is time to close. Using a telescoping skimmer (the thing with the net), clean debris from the bottom of the pool and surface, like leaves, twigs, seed pods, etc. Next, vacuum the pool, following instructions for your particular brand and model of pool cleaner. Make sure your vacuum is designed for above-ground pools. Thoroughly clean all surfaces, especially the pool's sides and bottom. All that debris will be there in the spring, and will be even more difficult to clean if you don't tackle it now. If the vacuum doesn't get all of it, use a brush to scrub those hard-to-reach areas. For areas that didn't get cleaned by the vacuum, get out the brush and scrub surfaces. This includes walls, coves, floor, steps, and ladders. Use a cleaning solution recommended by the manufacturer of your above-ground pool. Now's the time to really clean the liner of your pool. If you allow it to sit several months, it will be an even tougher cleaning job come spring. Thoroughly inspect inside and outside the pool for leaks. If a leak is detected, contact the manufacturer of your pool for advice on repairing it. Open up that winterizing kit, carefully following instructions. Shut off the pump (motor) before cleaning the filter. Turn the filter's handle to "backwash" and pour the filter or winterizing cleaner from your kit into the skimmer. Depending on your closing kit, the next solution you might pour into the skimmer is an oxidizing agent. Allow both the cleaner and oxidizing agent to circulate for a couple hours or the time suggested on the kit's instructions. If you have a salt chlorine generator or use chlorine you might pour another winterizing agent into the skimmer--it usually contains sodium tetraborate--aka borate. This will be included in your kit. Removing the skimmer without installing a winterizing kit could result in damage to the pool wall, liner, and pool installation, and voids any warranty. Skimmer damage caused by freezing temperatures is not covered by product warranty. Clean and drain pump, filter housing and hoses. Follow manufacturer's instructions for draining your pool, paying attention to where and how the water is drained. Also check with your city regarding rules or laws for draining pools that have been treated with chemicals. Intex advises sprinkling talcum (baby) powder on the pool liner to prevent the vinyl from sticking together. Tightly roll the liner to avoid creases and place in a dry, protected storage area. Keep together all small parts along with the filter pump, manual, and pool, and then place in an area that will remain at room temperature throughout the storage season. As advised earlier, the instructions for removing some of your above-ground pool's components, along with draining the water, and disassembling it, may not apply if you live in a mild-winter region. Again, consult your pool manufacturer and local pool supply store for assistance. Medallion Energy, experts in pool heating, recommends adding inflatable air pillows that float on the top of the water, right under the cover. In case of a freeze (it does happen), the air pillows will cushion the pressure from any ice buildup. Using a cover made for your brand of above-ground pool, secure it tightly with winter-cover clips or a cable and winch, advises Medallion. If water pools on top of your cover, brush it off or use a submersible pump or bucket to remove it. When swimsuit weather rolls around, you'll have an above-ground pool that should be clean and easy to assemble.